Who would benefit by using Push Back Rack? Looking for a Push Back Rack? You have come to the right place! Hundreds in stock, huge selection to choose from. Click here: Burtman, Frazier, Hi-Line. Pushback Rack is a reverse flow storage system which offers the same storage density as Drive-In Rack, but with much greater selectivity. This rack is also known as Reverse Gravity Rack. Pushback Rack allows for a "Last In, First Out" (LIFO) rotation inventory management system as well as a reduction in the number of fork truck aisles needed in your warehouse. This translates into increased productivity, efficiency (time savings) and optimizes your existing space. 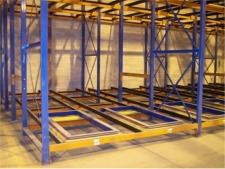 Loads/pallets are stored and retrieved from the aisle. Loads in each pushback rack lane rest on a cart, which sits atop a rail that slopes gently toward the front (towards the aisle). When a new load/pallet is deposited onto a cart within a lane by a forklift, it "pushes back" the one already at the face as well as those behind it. 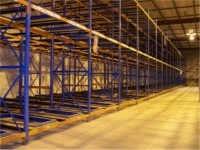 Depending how "deep" (2 deep to 6 deep) the rack is will determine how many pallets can be stored in that individual lane. Then, when a load/pallet is picked from the face of the rack or lane, the contents of the lane all move gently forward (at a controlled and slow speed) with a new pallet coming to the face, replacing the one just removed. This new pallet (which moved forward) is now also ready to be picked, or another pallet can be added ("pushed back") to fill the lane again. The goal of Push Back Rack is to eliminate honeycombing or empty pick faces. Its ideal use is where all loads in a lane are identical and "First In, First Out" (FIFO) stock rotation (i.e., Carton Flow Rack, Pallet Flow Rack) is NOT crucial. It is also beneficial for operations that possess a large number of multiple SKU’s (Stock Keeping Units). Since every lane operates independently of the other lanes within a bay, same SKU’s or lot numbers can all be stored in the same lane. Push Back Rack, being an accumulative storage system, allows you to store from two to six pallets deep per level with the only restriction on the number of levels being the reach of your lift truck. Multiple levels can be designed to go 30 feet or higher. Push Back Rack works with nearly every type of forklift: swing reach, narrow aisle, counter balance, etc. We carry many Push Back Rack manufacturers in our used pushback rack inventory with our most popular brands being used Frazier push back rack, used Burtman pushback rack and used Hi-line pushback rack. Pushback Rack “carts” and “trays” are also in our inventory if you need to add to your existing pushback rack structure or are in need of replacement parts.